The Tomar Shelf Mount (TSM) product line is ideal for situations where space is limited. This low-cost model provides RO water with minimal instrumentation and the smallest footprint available today. The Tomar Compact-Vertical (TVC) product line offers built-in pre-filters and more instrumentation options than the Shelf Mounts, while maintaining a relatively small footprint. This versatile system can even be wall-mounted where space is limited. 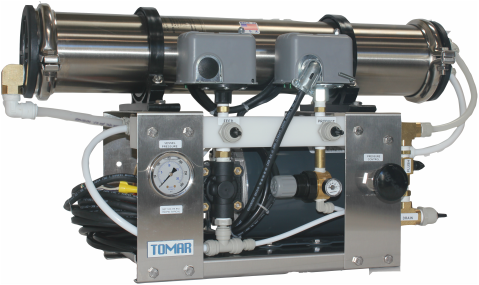 The Tomar Vertical (TV) product line serves a versatile range of water applications. With a much expanded output range over the smaller systems, the Vertical product line suits many water quality needs.The Vertical product line can also be configured to handle Sea Water applications. 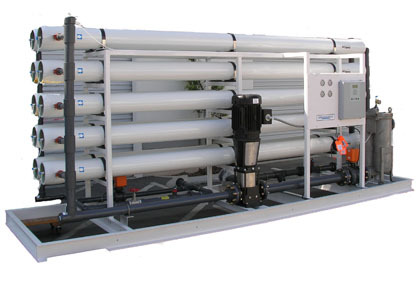 The Tomar Production (TP) line allows for large volumes and specialized water treatment. These custom engineered systems can handle a broad range of industrial, commercial, and agricultural applications. Cleaning in Place (CIP) systems extend membrane life and eliminate the need to transport membranes to cleaning facilities. 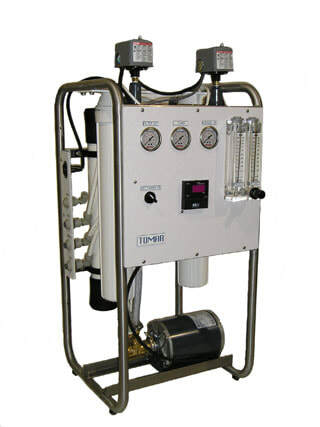 Tomar offers full CIP products to serve RO systems of any size. CIP systems are assembled on a dedicated skid which include the necessary pumps, tanks, heaters, controls, and standard instrumentation needed for the CIP process. Additional monitoring, such as pH, is available on CIP systems upon request. Tomar produces several models of cell test systems which allow for characterization of particular makes and models of membranes by challenging membrane samples with feed water appropriate to the application. ​In evaluating large scale RO system designs this process can qualify candidate membrane products without the expense and effort of full sized membrane element pilot testing. 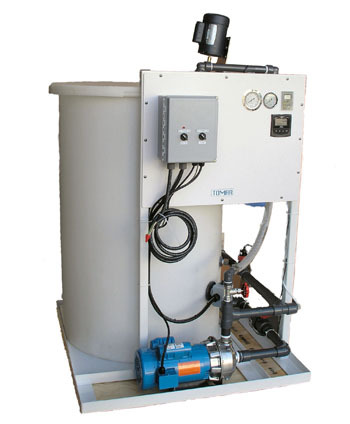 Reverse Osmosis/ Deionizing Resin (RO/DI) and Reverse Osmosis/Electrodeionization (RO/EDI) systems produce output water up to 18 megaohms and have been employed in chemical processes, medical device cleaning and semiconductor manufacturing. ​Tomar is well acquainted with the special considerations required in the design and implementation of such systems as to materials, instrumentation, safeguards and controls necessary to provide a reliable and dependable system product. 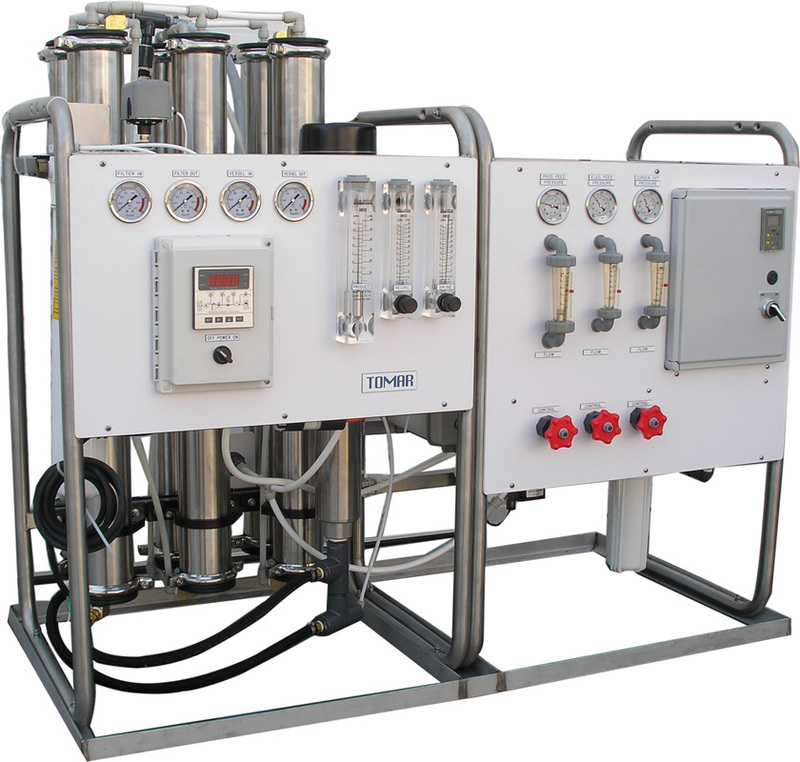 Tomar can design specialized integrated skid systems to provide the best solution to a water treatment requirement. Such integrated processes have included bulk media prefiltration, ozonation, UV, antiscalant injection, post pH correction injection as well as specific customer components. These specialized integrated systems come on a unitized stainless steel skid frame with central water and power connections. These systems have been produced for applications such as humidification control, environmental fog and misting, hothouse/agriculture, food processing, bio-manufacturing, power plant process water, potable water production and others.